Even if travel isn’t a regular part of your schedule, it pays to have certain items in your suitcase at all times. Having some key essentials to keep in your suitcase will not only help make your travel preparations easier, but it will also reduce your chances of forgetting something when you’re in a rush. Read our list of essential items to store in your suitcase so you’re always ready to hit the road when you need to. 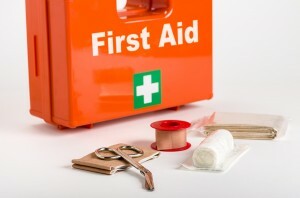 Wellness kit – While you’re likely to keep your prescriptions close at hand, putting together a health kit that you can stash in your suitcase is always a good idea. Pick up small sizes of antacid, band aids, antiseptic ointment, throat lozenges, anti-fungal medication and decongestant will save you the hassle of trying to find an open drug store in a city you’ve just arrived to. Toiletries – Keeping travel-sized versions of your favourite personal care items such as shampoo, conditioner, deodorant and shaving cream packed in your suitcase is one less thing you have to worry about, should you need to travel at a moment’s notice. Be sure to check your supply of toiletries when you return from your trip so that you’re stocked up for the next time you travel. Electronic cords and chargers – From your laptop to your smart phone, there’s nothing worse than having the battery life of your electronic device end abruptly. Keeping an extra set of cords and charging devices in your suitcase is a quick and easy solution that ensures neither you (nor a colleague) find yourself without power. Travel clock – Sure your smart phone can double as an alarm, but having a backup doesn’t hurt either. Let’s face it, when you’re in a new location, you’re out of your regular routine and you might need a little extra help waking up. Have the alarm on your smart phone set for your desired wake time and then use your travel clock as a backup that’s set for five minutes later. This ensures you’ll never sleep through your alarm. 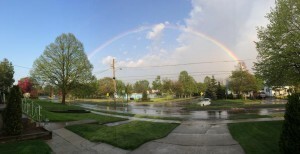 Rain check – When the weather forecast predicts sunny skies, rain isn’t something you think about. But, keeping a small-sized umbrella and folded rain poncho in your suitcase at all times is a terrific way to avoid being stuck in the rain. Whether you’re in town for vacation, or enjoying a short term rental on a business trip, we highly recommend packing these five essential items to ensure you’re prepared anywhere you go! Organization is the key to travel success. When your schedule involves frequent business trips, having a set plan will ease the frantic pace that can be an unwelcome part of the journey. While you know that a short term rental has been the secret to a smooth and seamless stay during your travels, it’s sometimes a little more challenging to have peace of mind that you’ve left everything at home in working order. Here are 10 quick and easy things to do before leaving on vacation that will help keep you on track the next time you head out the door. By using this checklist as a starting point, you won’t have the feeling as though you’ve left something (or someone) behind. 1) Keep an emergency folder. Include a copy of your flight or train itinerary, the address and contact information of the furnished apartment at your destination and personal information such as your credit card and passport. Having these resources available at your office and home not only ensures that your colleagues and family members will be able to reach you if needed, but that you’ll be able to have access to the information you need should you lose something during your travels. 2) Home sweet home. Ensure that one or two of your closest neighbours are aware of your departure dates as well as when you’ll be returning. Keeping neighbours in the loop means they’ll have a watchful eye on your home should any unusual activity occur. Arrange to have a close friend or family member check in on your home while you’re away, collecting any mail and double checking that your home is in order – just be sure your neighbours are aware that someone will be stopping by. 3) Phone home. Have your home phone number forwarded to your mobile device. This will ensure that you’ll be available, and give the impression that you’re in the area to prevent your home from being compromised. 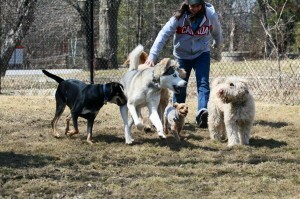 4) Organize pet care. Whether you’re having someone come into your home to pet sit or bringing your pup to a kennel, it’s important to have the arrangements made well in advance. Along with keeping additional pet food and treats available, you may want to purchase a new toy or two for the caregiver to give to your pet. During the first few days you’re away it may be a difficult adjustment period for your pet and a surprise may be a good distraction. 5) Rearrange plants. Keep your plants in a sink during the time you’re traveling will not only make it easier for the person who is watching your home to water, but it will also ensure they don’t forget to keep plants well hydrated. 6) Electric reduction. Turn off any electronics and unplug small appliances such as your blender or coffee maker to help reduce your home energy consumption. 7) Clean your kitchen. From the fridge to the compost to the dishwasher, clean your culinary space from top to bottom. Freeze any leftovers, pitch the perishables and make a list of what you’ll need when you return. While it may be a bit of a chore to do before you leave, you’ll be happy you did once you’ve returned from your travels. 8) Refill prescriptions. Even if you’re mid-way through your current prescriptions, having refills in your carry on is essential. You’ll be happy you did if your luggage containing medication gets delayed, or worse – lost. 9) Hire outdoor maintenance help. Keeping freshly cut grass or a shovelled driveway is a good indication that people are home. Hiring someone to do your yard work while you’re away will help you keep up the appearance and illusion that the house isn’t vacant. 10) Contact your credit card company. Keeping your credit card company aware of your travels will help prevent any potential fraud that can happen while you’re traveling. Keep DelSuites’ top ten things to do before leaving on vacation in mind and we know you’ll have a stress and worry free trip. Happy travels! It’s that time of year again where many prepare for the Walk of Life in support of the Cardiac Health Foundation of Canada. For DelSuites furnished rentals, this is an opportunity to become involved by supporting this great cause. And with our support, the funds raised increases awareness and is used for “Prevention, Education & Cardiac Rehabilitation”. The 30th Anniversary Toronto Walk of Life will be taking place on Sunday May 25th at Evergreen Brick Works. You can still register in person on Sunday at 8:00AM. Together we are making a difference! 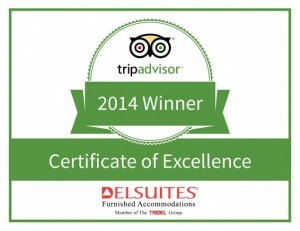 TripAdvisor® has honoured DelSuites with a 2014 Certificate of Excellence. This great achievement honours hospitality excellence and is presented to organizations that attain top ratings from TripAdvisor traveller reviews. TripAdvisor uses a proprietary algorithm to determine the honorees which takes into account reviews ratings. To qualify, companies need to maintain an overall rating of four or higher, out of five, as reviewed by travelers. Additional criteria include the recency of reviews in the last 12 months. 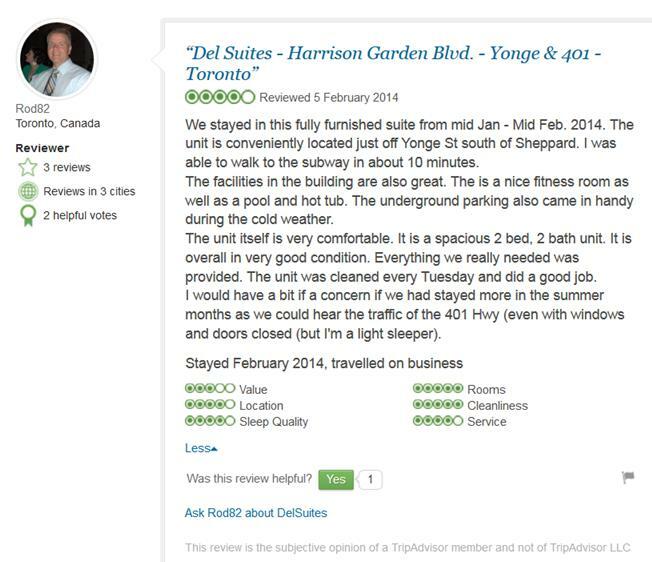 View the DelSuites TripAdvisor press release.